Home Asia	Where is the Taj Mahal? A building known and loved by people around the world, the Taj Mahal has become an icon of India. Awe-inspiring, grand in scale and steeped in history, it’s a monument that certainly needs to be seen to be believed. If you’re thinking of visiting this incredible site, learn more about its past, who built it, where the Taj Mahal can be found, and more! Who built the Taj Mahal? Considered to be one of the greatest Mughal emperors, Shah Jahan ruled a large portion of the Indian subcontinent from 1628 to 1658, and commissioned the construction of the Taj Mahal. Encompassing the majority of modern day India, Pakistan, Bangladesh, Afghanistan and other surrounding areas, the empire was expansive and renowned for its fine Indo-Islamic architecture. Details of the Taj Mahal. Image Credit: gigile / CC by 2.0. Shah Jahan was married to several women (a common occurance at the time), but was besotted with one, his chief consort and clear favourite, Mumtaz Mahal. The couple had a loving relationship and the emperor valued Mumtaz Mahal as a close confidant and adviser. During the birth of the couple’s 14th child in 1631, Mumtaz Mahal suffered a hemorrhage and passed away. Heartbroken at the loss of his wife, Shah Jahan is said to have been paralysed with grief and retreated from the public eye for a year to mourn. On his return to public life, Shah Jahan commissioned the Taj Mahal as a mausoleum for Mumtaz Mahal. When was the Taj Mahal built? 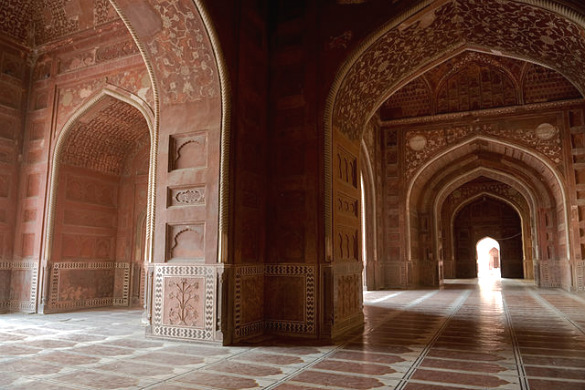 Arches within the Taj Mahal’s mosque. Image Credit: Mike Bostock / CC by SA 2.0. Following the death of Mumtaz Mahal in 1631, construction of the Taj Mahal began in 1632 after being commissioned by the emperor. By 1643, the main structure was largely complete, with further structures, including a mosque, finished in the next ten years. In 1653, the spectacular monument was complete and Mumtaz Mahal was interned beneath the vaulted dome of her tomb. Over the course of the 21 year construction, it is said that around 20,000 people and 1,000 elephants were employed to help achieve Shah Jahan’s architectural dream. Requisitioned from across Central Asia, India, Iran and beyond, workers, including craftsmen, builders, artisans, contributed their skills to the major project. Along with builders and masons, carvers, painters, calligraphers and others with very specialised skill sets were employed to help make the building a reality. The Taj Mahal is located on the southern bank of the Yamuna River in the Indian city of Agra. Situated in the northern state of Uttar Pradesh, the iconic structure is around 200 km south of New Delhi, India’s current capital, and approximately 250 km from Jaipur, another of the state’s prominent cities. Trains run from New Delhi to Agra quite frequently, meaning that a daytrip from the Indian capital is a great option. 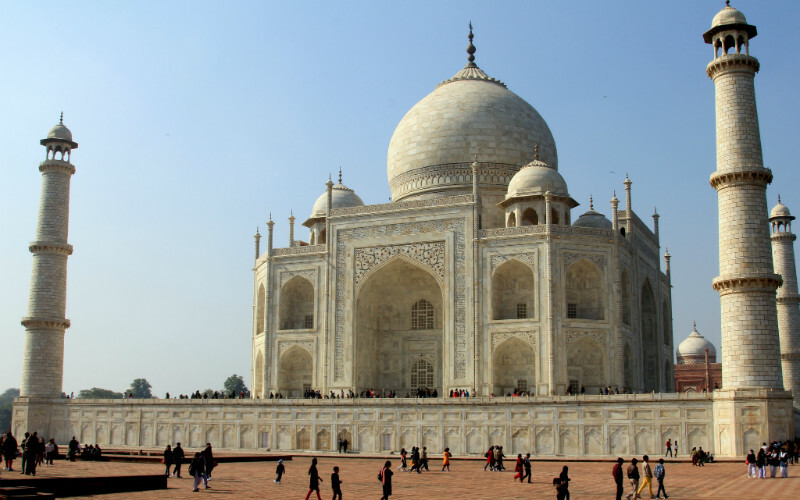 What makes the Taj Mahal so special? As one of the world’s most famous buildings, there are plenty of reasons why it is considered to be so special. It’s a symbol of love and devotion. We’ve all heard stories of romance and grand gestures, but the construction of the Taj Mahal tops them all. Built to honour the emperor’s wife, and serving as her final resting place, the building was designed with no other purpose than to embody their devotion to each other. It is incredibly beautiful. 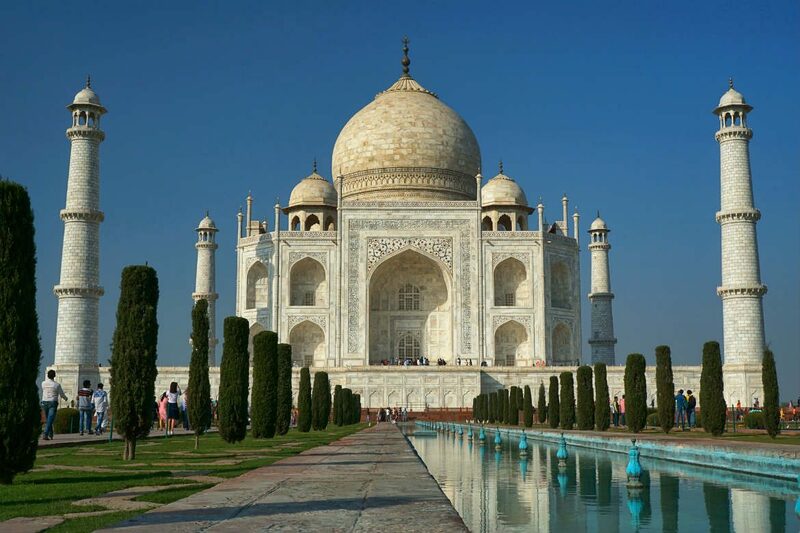 Constructed from white marble and inlaid with precious stones, the beauty of the monument is said to reflect that of Mumtaz Mahal, and it’s easy to believe. Spectacular at sunrise and sunset as the colour of the marble shifts and changes, the 170 metre tall structure is a sight to behold. The design is impressive. Close to completely symmetrical, the Taj Mahal is not only aesthetically pleasing but also quite remarkable for the period of history in which it was built. Without the use of computers, calculators and construction machinery, the skilled workers were able to deliver an astounding building. It’s on the UNESCO World Heritage list. In 1983, the Taj Mahal was recognised for its universal value and the way in which it represents the best of Indo-Islamic architecture. Taj Mahal, Agra, India. Image Credit: Piyush Kumar / CC by 2.0. Want to see the beauty of the Taj Mahal for yourself? 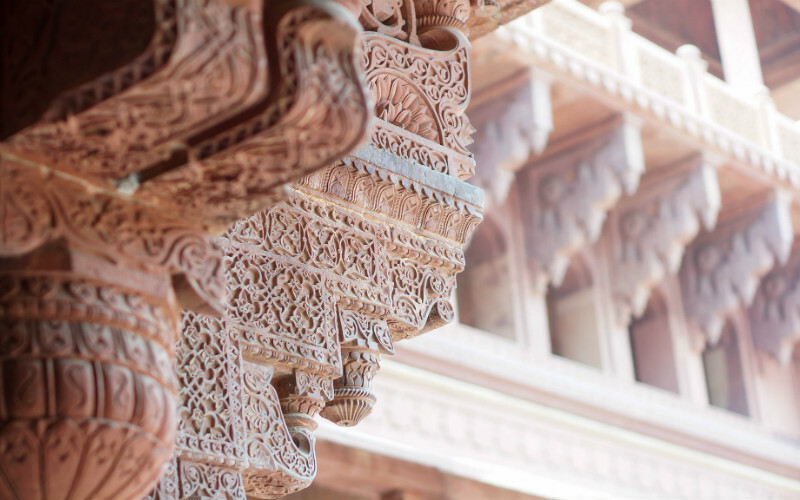 Secure your place on an unforgettable India tour from Webjet Exclusives today!